I am new to this grand weaving adventure! However, I can not find any videos or good instructions about warping my sectional beam. I hope you can help. To do traditional sectional warping, you will need a spool rack and spools, a tension box, and a thread counter (for a description of each step accompanied by photos, see “Use Sectional Warping for Easy Warp Stripes” by Betsy Blumenthal, Handwoven, November/December 2008, pp. 48-50). What you do is wind enough spools to fill each section with all of the warp threads in the section. If your sectional beam has 2-inch sections and you are threading 10/2 cotton at 24 ends per inch, you will need 48 spools. Each spool must have on it the number of yards it would take to fill all of the sections you are using. If you are filling ten sections of 5 yd each, each spool will need 50 yds (hence the need for the counter to determine the number of yards on the spool). You thread all 48 ends through the tension box and through the little reed it holds and wind the 48 threads into each section, one section at a time. There are other ways to thread sectional beams. Some weavers use a warping wheel instead of spools (the threads for each section are wound on the wheel). You can also wind a warp on a sectional beam just as if it were a regular beam. If your sectional beam is divided by wire pieces, this works well without any additional steps. If the sections are divided by pegs (with the thickness of a dowel), the warp threads can hang up on the pegs. My first loom had a sectional beam with pegs. To beam the warp as if it were a regular warp beam, I made a raddle that I put on top of the back beam. 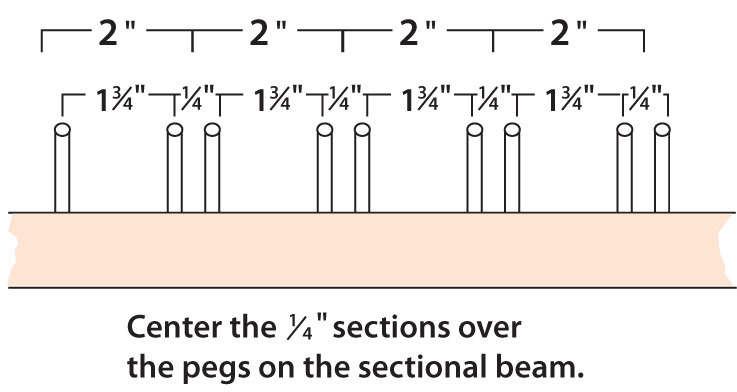 My sectional beam had 2″ sections, so I placed finishing nails on the raddle alternating 1-3/4″ spaces with 1/4″ spaces. I spread the warp into the 1-3/4″ spaces only and positioned the raddle so that the 1/4″ spaces were directly above the pegs on the beam. Then, as I turned the beam, the warp threads fell only into the sections and not on the pegs. Even though I was not using a sectional warping method, I was able to take advantage of one of its benefits: I didn’t have to separate the layers with paper or sticks as I would using a regular beam. 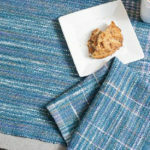 Explore these weaving resources at Interweave! 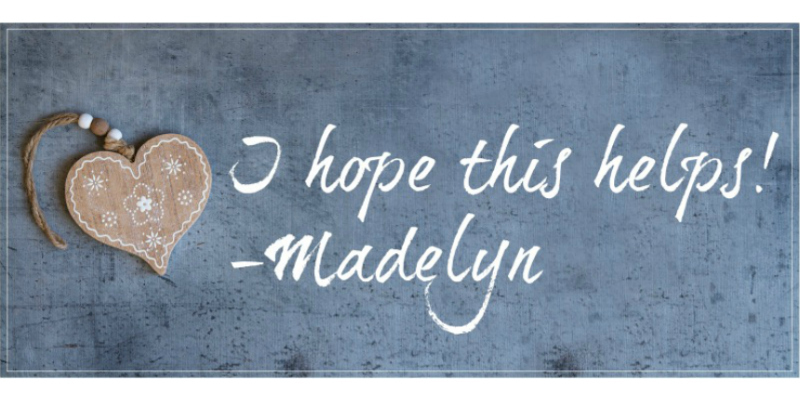 Hi Madelyn, your answer about warping a sectional beam was so clear. I inherited both the tension box and a creel with 48 spools and had no idea as to how to use it. What a revelation. I will try this next time. The Recipe for a Perfect Picnic—With a Real Recipe!